L-R: Rik Pek (MD Broekman Logistics); Emile Hoogsteden (Dir. Containers, Breakbulk & Logistics from Port of Rotterdam); Willem-Jan de Geus (Dir. Metaaltransport) and Peter van der Pluijm (Dir. RHB). Photo: Marc Nolte. 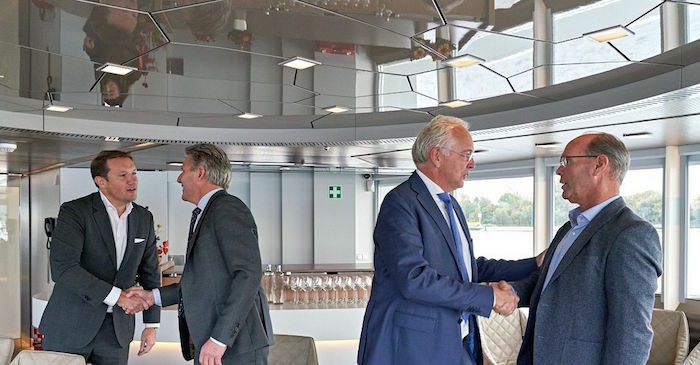 Breakbulk carrousel’ gives breakbulk and heavy cargo companies space for further growth in Rotterdam’s Waalhaven. ‘This operation, which was carefully prepared over a long period together with the involved companies, enables us to demonstrate that we are giving the Rotterdam breakbulk sector ample space to develop’, stated Emile Hoogsteden, Director Containers, Breakbulk and Logistics at the Port of Rotterdam Authority. ‘This particularly concerns heavy lift, project cargo, steel and non-ferrous metals. Rotterdam is already well-positioned for this, due to its unique location, container logistics connections and increasing number of scheduled breakbulk and heavy cargo services. Metaal Transport will retain the Heijplaatweg location, including the offices, and will construct a 25,000 square metre warehouse on the new site.